Be Your Self, Harrison Elliott, Zoë Dunwoodie, Rowan Rossi, Natalie Allen, Christopher Mills, Kimball Wong, Thomas Fonua, Matte Roffe (c) Photo by Oliver Toth at Accent Photography. 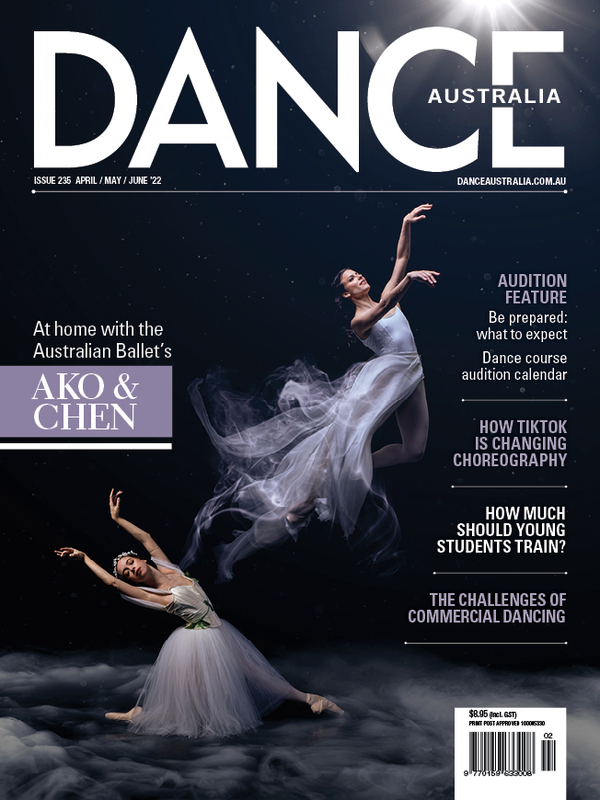 This year is the twentieth anniversary of Garry Stewart’s appointment as artistic director of Australian Dance Theatre, and the company marked the occasion with a celebratory gala extending over two nights. Friday 5 April, the second night, doubled as a fund-raising event with the SA state premier and other dignitaries in attendance, speeches aplenty, and wine and canapes in abundance. As the title "Anthology" suggests, the audience was treated to a selection of excerpts from Stewart’s oeuvre, and it too proved to be something of a feast. The program comprised a mixture of live and filmed excerpts of Birdbrain (2000), Be Your Self (2010), The Beginning of Nature (2016), Proximity (2014), Devolution (2006), G (2008) and The Age of Unbeauty (2002), thus giving an insight into both the through-lines and the evolution in Stewart’s work. While the works up until 2010 feature the hyper-virtuosic physicality associated with Stewart’s name, the later works are more variable in style. It has to be said that never have the dancers looked stronger, tackling this marathon with superhuman attack, energy and precision. It was a huge pleasure to see present company members joined on stage by past members Sarah-Jane Howard, a dancer with Meryl Tankard’s ADT before joining Stewart’s ensemble, who is now associate director; Daniel Jaber, returning to the fold after working in the USA and interstate; and Natalie Allen, stepping in for an injured Jana Castillo. The filmed excerpts were a reminder of the many superb dancers who have been part of the company under Stewart’s watch: Tanja Liedtke, Kristina Chan, Paul White, Larissa McGowan, Anthony Hamilton, Lauren Langlois, Amber Haines, Kyle Page, Tara-Jade Samaya, Scott Ewen, Kialea-Nadine Williams, Gabrielle Nankivell, Lina Limosani—the list goes on—are all seen dancing at their peak. Zoë Dunwoodie, Daniel Jaber, Christopher Mills, Thomas Fonua, Matte Roffe, Harrison Elliott, Natalie Allen and Rowan Rossi in 'Birdbrain'. Photo: Oliver Toth at Accent Photography. The program opened with Birdbrain, Stewart’s first major work for the company, a postmodern deconstruction of Swan Lake. As with G, in which he gives Giselle similar treatment, Stewart uses projected text to ironise the plot, and intersperses steps from the ballet lexicon with breakdance moves and acrobatics. Matte Roffe’s fluent channelling of Odette was a stand out in Birdbrain, whereas Daniel Jaber’s fleet batterie and extensions shone in G.
Sarah-Jayne Howard, Christopher Mills, Zoë Dunwoodie and Matte Roffe in 'Devolution'. Photo: Oliver Toth at Accent Photography. In Be Your Self Stewart renders the human body as a mechanical object of almost infinite strangeness, aided by the creaks, pops and gurgles of Brendan Woithe’s score. This work is as fresh and entertaining now as it was in 2010, and the selected section was delivered with staggering energy by the cast, particularly Kimball Wong, whose barrel jumps and head stands didn't seem humanly possible. 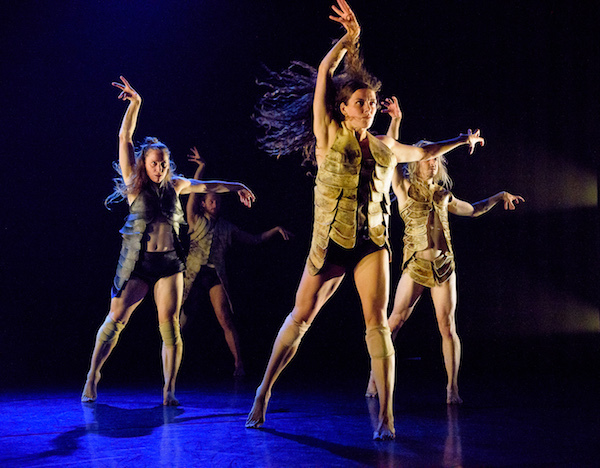 Devolution, Stewart’s investigation into the relationship between the robotic and the human, cranks up the strangeness with the dancers, clad in insect-like leather costumes, swarming in entomological fashion. The film clip reminded us just how uncannily human the robots were in the original, seeming at times to be tapping their toes and engaging in human interactions. 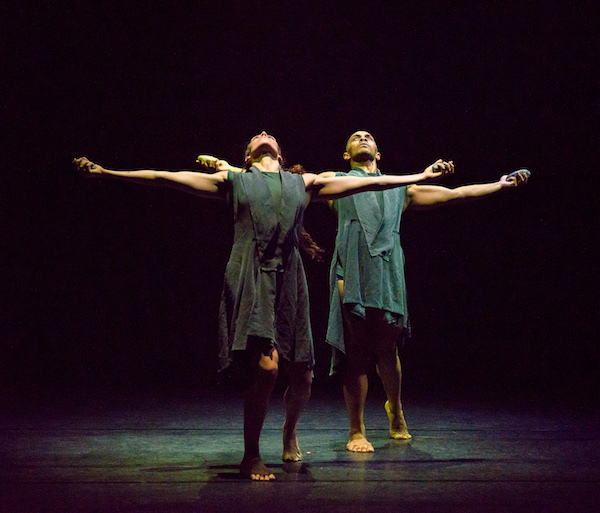 Zoë Dunwoodie and Thomas Fonua in 'The Beginning of Nature'. Photo: Oliver Toth at Accent Photography. Proximity also explores the relationship between humans and technology, but the interlude presented here, a trio performed by Daniel Jaber, Kimball Wong and Zoe Dunwoodie, has a serene quality in which human relationships predominate. The long section from The Beginning of Nature marks another departure in Stewart’s output. This work has an elemental quality with its emphasis on natural forms, its use of props and its lyrical score performed by the Zephyr String Quartet and singers in the Kaurna language. The program closed with The Age of Unbeauty, an investigation into man’s inhumanity to man, which created an ominous and suspenseful mood with moments of brutality interspersed with tenderness. The evening was imbued with a strong sense of history: in Stewart’s speech at the conclusion he acknowledged the presence in the audience of ADT’s indomitable founder, Elizabeth Cameron Dalman, and dedicated the evening to the memory of Jonathan Taylor, ADT’s artistic director from 1976-85, who sadly passed away recently. Nevertheless, the mood was overwhelmingly one of celebration of Stewart’s astonishing curiosity, creativity and choreographic innovation. Pictured top are Harrison Elliott, Zoë Dunwoodie, Rowan Rossi, Natalie Allen, Christopher Mills, Kimball Wong, Thomas Fonua and Matte Roffe in 'Be Your Self'. Photo: Oliver Toth at Accent Photography.